YouTube seems to be full of channels dedicated to rednecks and other backcountry-type folk doing stunts with cars that would otherwise be junkyard bound. While these videos are obviously quite entertaining, we can’t help but think the some of the stunts are a bit dangerous. 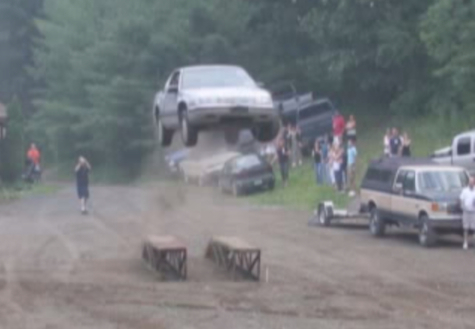 This Chevrolet Lumina jump video, brought to us by the aptly named ‘784Idiots’, is one of those videos where we were concerned about the safety of some of those involved. It features a first-gen Lumina coupe, a steep makeshift metal ramp and one very fearless driver who probably suffered from whiplash related injuries for a good while after his stunt. Saftey concerns aside, this jump is probably one of the most impressive we’ve seen on YouTube, and is definitely the most impressive ever performed by a Lumina. The pilot of the mid-size W-body Chevy in question holds nothing back, charging at the ramp with a surprisingly amount of speed and launching himself into the air before the car comes crashing down on its nose. Check it out in the video below, and please refrain from replicating this for yourself at home, even if you have an unused Lumina sitting around just waiting to be jumped redneck style.